I started my career at Finnvox in 1984. In the beginning I mastered vinyl records but became a full-time CD-mastering engineer in the early 90’s. I Have done masterings for approximately 2000 LPs, over 3600 CDs and innumerable amount of singles which makes about 100.000 songs in total. Nowadays more well-known from my masterings for heavy metal and hard rock genres. As a hobby I have been a singer-guitarist for a few bands and nowadays I’m a passionate photographer. Some of my best shots are seen in my Facebook site, as well as latest news from the mastering studio. Mediamaja: Bandworkshop Masterointi, haastattelussa Mika Jussila. Published 14.1.2010. Mika Jussila ​​Finnvox Mastering Engineer | Interview by Metalovision // Entrevista a Mika Jussila. Published 5.11.2014. The fine tuning and trimming of the new Nightwish album has ended at last. Holopainen, Kinnunen and Karmila got all the tracks of the forthcoming Imaginaerum mixed and several test masterings were done during summertime. There are no words to tell what kind of a musical firework the album will be. After the previous record I pointed out to the band that it will be a mission impossible to outreach the perfect Dark Passion Play album – how wrong was I. It’s a pity how long all the fans have to wait to hear and feel the same that I have. And I’m not making the case any easier by flattering and praising Imaginaerum to be the best of its kind because it will be something no one has ever done before. Personally I hope the longest possible career to Nightwish because every member of the band has the unique honesty, down-to-earth mentality and frankness. They have deserved all the glory they have got! 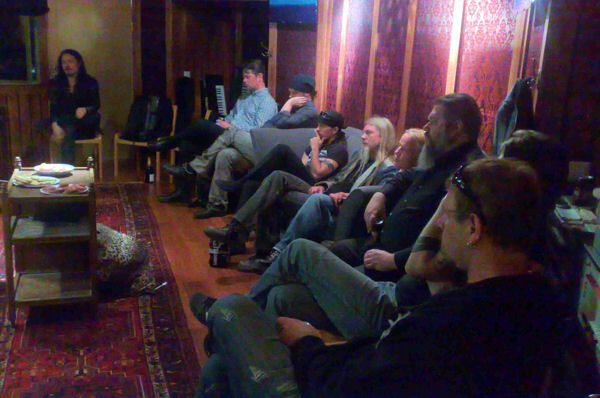 In the end of May we had a listening session at Finnvox together with the band (without Anette), Karmila, Kinnunen and Stobe Harju & Petri Alanko working on the movie score. Tuomas brought some champagne and I took care of some salty and sweet snacks. After stunning and dead-dropping experience we headed off to a tight and exciting bowling match Nightwish against technicians. 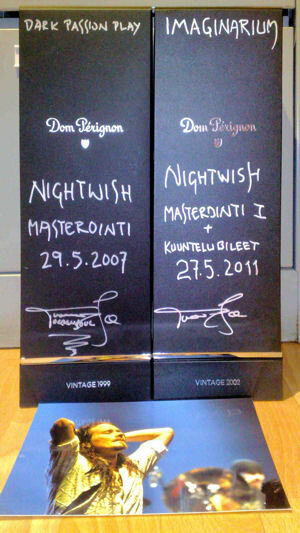 Using some irregular and violative arrangements in their team Nightwish won the competition. Unfortunately the anti-doping committee was not visiting on their track. Post mortem of the bowl game were forgotten during Lappish dinner in the centre of Helsinki, only without the guitar hobbit whose diet included only liquid nourishment. It’s been too long time from my latest update. I’ve been working hard with the chronicle of a floorball team I coached over eight years and that’s why all other news have been left in background. But what has happened during the very busy spring time? The most remarkable news must be that I have been taken a part owner of Finnvox Studios! Our main owner offered Risto, Pauli and me a possibility to purchase one third of Finnvox shares. And now we share the risk of owning a music studio. In mastering the spring has been a busy period as usual. The fast growing number of foreign customers is really pleasing me, especially the active Italians. My deepest thanks go to Corvi Wahoomy from Real Sound Studio. Wao has kept me busy every now and then. If you are interested in names and bands you will find updated lists from here. Also a notable thing is that some of my photographs have found their way to CD covers, for example Killing Joke, Viikate and Kolmas Nainen. On the red carpet of Cannes! Eternal Hammerer Ilmarinen, heroic artificer-smith. Craft the dome of the sky, Created a myth of Skyforger. Unofficial opening words of www.mikajussila.fi - site.